From teen pop heartthrob to experimental orchestral composer, Scott Walker has built up a substantial and vastly influential body of work in a career spanning five decades. Some of his most significant work was arguably released on his solo albums Scott, Scott 2, Scott 3 and Scott 4 between 1967 and 1970, with iconic tracks such as Plastic Palace People (Scott 2) and The Old Man’s Back Again (Scott 4) released during this time. In July, the Royal Albert Hall played host to a special Late Night Prom paying tribute to this period of Walker’s life and music as part of its annual Proms series of classical performances. Conductor Jules Buckley and The Heritage Orchestra performed tracks from the four self-titled albums with vocals delivered by special guests Jarvis Cocker, John Grant, Richard Hawley and Susanne Sundfør. 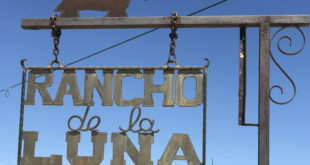 The event saw some of these tracks performed in full for the very first time and the event was broadcast live on BBC Radio 3 and recorded for TV. 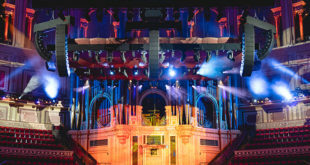 “It was an unusual project because a lot of it has not been performed before,” says senior studio manager Marvin Ware, who headed up the engineering duties behind a Stage Tec Aurus in the BBC’s OB truck Sound Three, which was present at the Royal Albert Hall for the entire Proms season. “The albums Scott to Scott 4 was the period post the Walker Brothers and many regard it as his wilderness years, but it was the orchestrations of the music that were absolutely crucial to the sound that he was creating on those albums,” he continues. Getting the broadcast element of an event of this scale and significance right obviously involves a lot of planning and requires an expert level of skill, which operations manager Huw Robinson says is “characteristic” of BBC engineers. 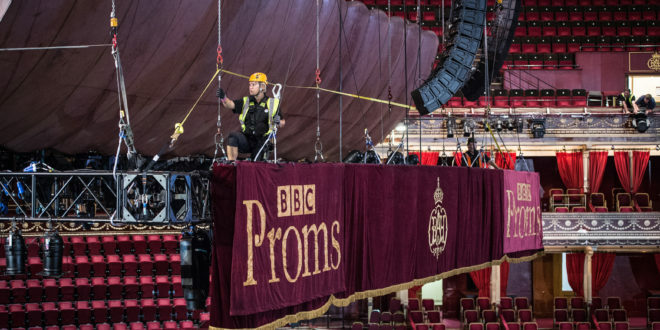 Robinson emphasises that the Proms are not like any standard date on a tour “when a group is coming into a broadcast infrastructure,” and what they are able to achieve “in the Royal Albert Hall has taken several years to turn into a well-oiled machine”. Ware tells AMI that the first step in the process was meeting with the Heritage Orchestra, Jules Buckley and PA company Delta Live. Once the initial mic list has been drawn up, the team went away to work out how to patch that all together. This event required about 170 mics to be patched up in about an hour. 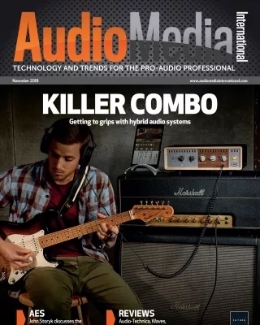 “There were a lot of AKGs, DPAs and various other dynamics,” says Ware. 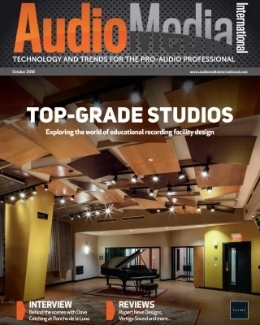 “There were also an awful lot of condenser mics out there, which is possibly unusual,” he says. “I do have the luxury of being able to use a lot of mics that are quite expensive, which wouldn’t necessarily fit if you were a touring band in a rock and roll world. There would be a lot of dynamics out there and an awful lot of DIs just to cut down on that spill. 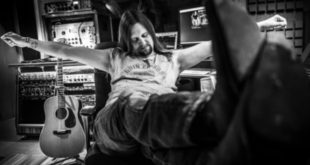 One of the biggest complexities of this project was the way in which Ware and his team in the OB truck had to work with the FOH engineer to get the mixes right. 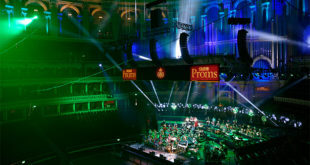 The PA company appointed for the Proms is Delta Live (who has been the preferred audio supplier to the Royal Albert Hall for around 20 years) with FOH duties handled by Stephen Hughes and monitors handled by Elaine Duffy. He adds that one of the biggest issues with this particular show is that with 170 mics on the stage, he needed to work out the acceptable level of colouration and how much colouration could be removed from his personal mix. 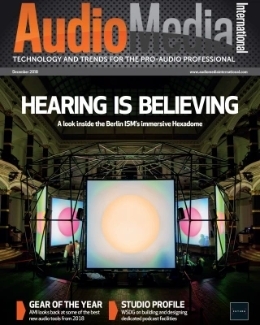 “There is inevitable colouration from monitor speakers, the PA and the cavernous size of the Albert Hall which has quite a lot of reverb of it’s own in there,” he says. In preparation for the show, the broadcast team, orchestra and solo artists had pre rehearsals in Maida Vale. “The PA company turned up and did a full mic up,” continues Ware. “Then we took the whole thing into the Royal Albert Hall, rehearsed it and then took it all down. Because it was a Late Night Prom, we had a rehearsal in the morning.